Jebel Ali Dragons welcome back Niall Statham from UAE duty. Abu Dhabi Harlequins will be looking to build on their 24-3 win against capital city neighbours Saracens in the Abu Dhabi derby last weekend when they travel to Jebel Ali Dragons. Mike McFarlane began his reign with an eventually comfortable victory in the derby and the Quins’ head coach will aim to continue their winning ways. McFarlane is a busy man at the moment and has been in hospital this week as he and wife await the arrival of their first child, but he is buoyed by the return to the capital of bulldozing centre Iziq Foa’i. Clashes between Quins and Dragons used to be for the biggest trophies in UAE and Gulf rugby but that changed last season as Dragons ran out of puff. 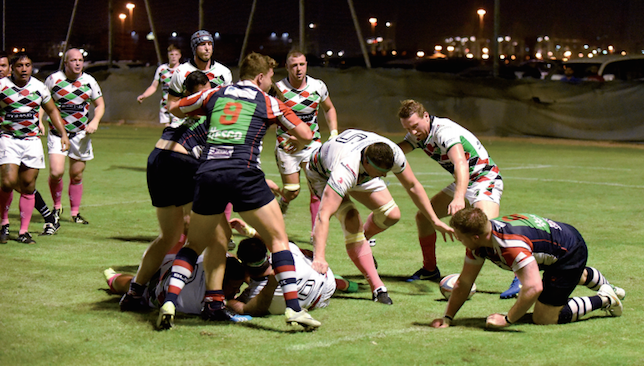 They lost their opener 14-5 to Dubai Exiles but performed well in a close encounter and hope to welcome UAE sevens heroes Niall Statham, Ryno Fourie and Ian Overton for the visit of the reigning champions. “We are aiming to click after a disappointing first game,” said director of rugby Paul Hart.